The development and designing of scientific instrumentation needed for UX-1 has begun! The first tests performed by the developer team from the University of Miskolc were carried out at Rudabánya, an open pit mine in northeast Hungary. Hitherto they have undertaken field missions at the old iron-ore mine, with more tests planned in the future. 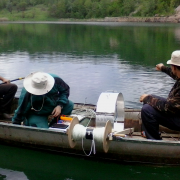 The main goals of these field tests are to investigate the ability, reliability, and application of different geophysical methods and equipment in underwater conditions similar to those UX-1 must overcome. 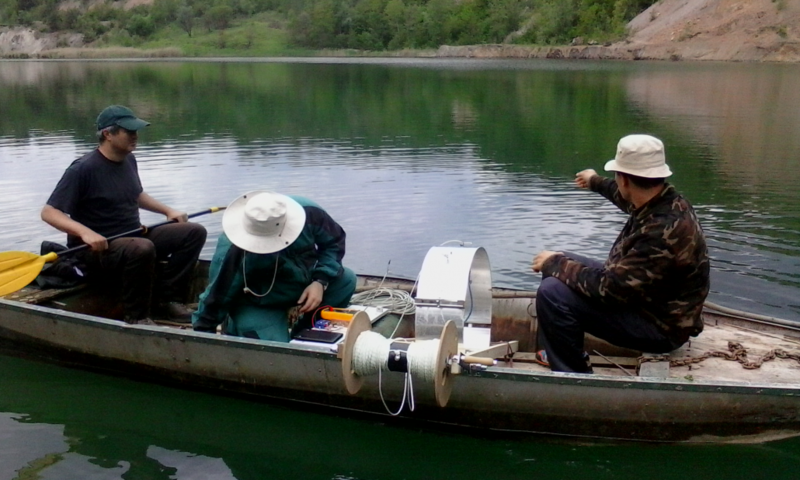 Test measurement in the lake of the Rudabánya open pit done by University of Miskolc. Lots of new and essential information and experience has been collected during instrumentation preparation, the measuring process, and the result interpretation and evaluation phase. The selection of measuring methods and the respective development work is continued on the basis of those gained experiences. Laboratory measurements and improvements occur at the same time, in parallel to the field measurements, in an evolving and interlinked process. The field tests carried out by University of Miskolc are an essential part of the development process of the robot’s scientific instrumentation that ultimately will lead to the instruments the robotic platform will carry during its missions. This is one of the most important pieces of the puzzle that is constructing an autonomous underwater robotic system, capable of mapping underground mines and extracting valuable information from them!